These garden obelisks are suitable for use as a sweet pea obelisk or even an outdoor tomato plant support. The height creates a vertical garden for you with minimal effort, making a very impressive garden feature, at the same time as providing support for your climbing plants. 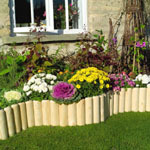 These plant supports are ideal for use with most perennials, herbaceous and climbing plants. These plants supports help to retain plants from your lawn and path ways. Scrolled shrub support is a one piece construction manufactured in Great Britain from metal and given a PVC coating to give protection against our weather conditions. As well as been decorative scrolled design this herbaceous support can be used to support and protect splaying or floppy plants or shrubs. Measurements: 37cm diameter by 65cm high. Scrolled shrub support is a one piece construction manufactured in Great Britain from metal and given a PVC coating to give protection against our weather conditions. As well as been dramatic impressive scrolled design this herbaceous support can be used to support and safeguard splaying such as Campanula and other plants. Measure: 59cm diameter by 68cm high. These climbing plant support are ideal for use in planter and garden pots. Manufactured from steel with plastic coating for extra protection. These garden climbing plant supports are ideal for use in planter and garden pots. Manufactured from steel with plastic coating for extra protection. 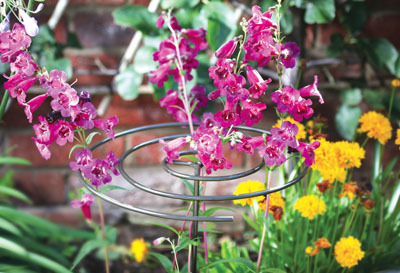 These garden plant supports are ideal for low bushy plants. Can be use in planter and garden pots. Manufactured from steel with plastic coating for extra protection. Made from steel and coated in a dark green plastic coating. These plant supports can be to contain already established plants, simply push the leg section into the ground behind the plant and attach one end of the ring to gather the plant in side the ring. Made from steel and coated in a dark green plastic coating. These plant supports can be to contain already established plants or for plants to grow through. Can be used as a versatile circle support or to form two loops side by side. Protect your plants from the damage from rain and wind. Ideal garden support for large peonie plants and other plants which require supporting. The plant will get all the protection required from this garden support. One piece construction, constructed from heavy duty steel and black coated for protection. Four feet pushes easy into the ground to give good support and decorative ball tops giving a decorative garden feature in any garden border or container. Small size: 65cm high by 35cm diameter. Medium size: 68cm high by 45cm diameter. 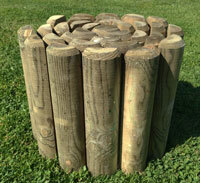 Medium size: 85cm high by 60cm diameter. Tower garden plant support made from one peice construction with black PVC coating for durability and long-life. Decorative and practical plant support for the longer stemmed plants, ideal for use in garden borders and plant troughs. Measurements: 18cm diameter by 50cm high. Measurements: 26cm diameter by 63cm high. Measurements: 32cm diameter by 75cm high. Heavy duty steel one peice construction growbag frame system. grow-bag plant frame has 3 rings to hold canes in place. Manufactured from steel rod with black PVC coating. Measurements: 48cm high by 30cm wide by 70cm deep. Valuable for keeping plant tidy, this support can be used for a wide variety of plants, such as carnations or smaller peonies. Hand crafted from heavy duty steel, with a decorative ball on the tips of each strut, these supports are plastic coated for durability. Valuable for keeping plant tidy, this garden plant support can be used for a wide variety of plants, such as carnations or smaller peonies. Hand crafted plant support frame from heavy duty steel, with a decorative ball on the tips of each strut, these supports are plastic coated for durability. Add height and interest to your garden borders with this willow pyramids ideal for climbing plants as well as climbing beans and peas. Made from natural whole willow woven to form a robust plant support. Add extra height and interest to your garden borders with this willow banded pyramids ideal for climbing plants as well as climbing beans and peas. Made from natural whole willow woven to form a robust plant support obelisk. This Acacia willow wigwam will make an excellent garden plant support for a large variety of climbing plants. Made from natural willow giving a garden cottage style look in your garden. 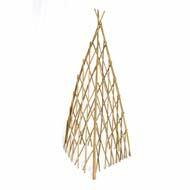 This wooden willow plant support is a one piece construction and expands easily and quickly. Manufactured from strong durable willow. Create structure and height with this stunning natural willow support. Designed to give support as the plant grows trough the willow support. These shrub supports will also offer protection to shrubs and plants. Triple pack of plant supports made from 7mm thick iron rod with ball top. Pack of 3 Climbing plant supports are finished with plastic coated finish. Made made in Yorkshire. Sizes: 1 metre high, 1.5 metres high and 1.75 metres high. Create a centre piece in your garden with our garden garden arches perfect fo make an entrance.